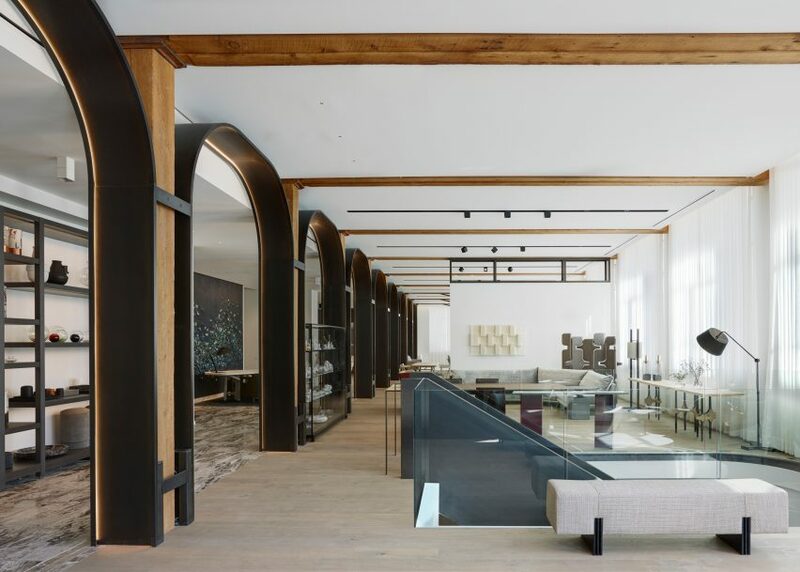 Metal arches and rough wooden columns form an illuminated colonnade through design retailer Avenue Road's new showroom in Vancouver. The 12,000-square-foot (1,115-square-metre) display space spans two floors in a 100-year-old building in the city's trendy Gastown District. The new outpost is intended to help Avenue Road continue its mission to introduce the unknown European talent to the North American market. Founded by curator Stephan Weishaupt and Canadian design duo George Yabu and Glenn Pushelberg, the company now represents designers and studios on both sides of the Atlantic, with locations already in New York, Toronto and Miami. "We are thrilled to put down roots in Vancouver, a place that we believe will identify with our personalised service, curated contexts, and truly global perspective," said Weishaupt. Working with Toronto-based designer Abraham Chan, Avenue Road has transformed the industrial spaces into a series of apartment-like rooms. These are furnished with contemporary architectural products, kitchens, lighting, furniture, textiles and accessories, following the style for its New York showroom, which was expanded last year. The concept follows a model that brands and galleries including The Future Perfect, Carl Hansen & Sons, Early Work and Pelle have all also recently used to entice buyers. Chan and Avenue Road first cleaned up the Toronto space by covering brickwork and mechanical systems, and painting all the walls white. Existing rough wooden beams and columns are left exposed as a contrast to this neutral backdrop, with a series of other industrial-style metalwork providing a reference to the history of the space. "The space is very much a reflection of Vancouver, which we see as this cosmopolitan city set within a landscape of raw, natural beauty," said Chan. "It's this juxtaposition between raw and refined that we sought to evoke in our design." The top floor is used to display furniture by Bruno Moinard, Raf Simons for Kvadrat, Christophe Delcourt and Van Rossum, as well as Canadian designers Unit Five and Jacques Guillon, and co-founders Yabu Pushelberg. Among the main updates to this storey was transformation of a set of existing wooden columns. Curved, black metallic structures lined with narrow lights are slotted in between the vertical elements, forming archways that frame the decorated spaces flanking either side. Chan laid marbled tiles across floor on one side. Pale wooden boards are placed on the other, with the existing wooden beams left exposed above to mark the divides between a series of room vignettes. The white walls between these areas are topped with black metal frames that nod to the industrial aesthetic, while other details include long white net curtains. "Throughout the space, you'll see certain materials and elements set in contrast to each other, whether it's smooth grey oak flooring paired with sand-blasted marble, or industrial steel set against softly lit walls," said Chan. Custom pieces also decorate this floor, including Moss & Lam's decorative blue wall created with 1,200 handmade glazed ceramic pieces, and porcelain manufacturer Nymphenburg's design featuring the Pacific loons bird in flight. The lower level is accessed by a staircase with a red metallic banister. It provides space to showcase Avenue Road's collection of category specialists, including textiles by The Rug Company, outdoor furniture by Tribù and Obumex's kitchens. There is also furniture that Spanish designer Jaime Hayón designed for Austrian manufacturer Wittman, and a collaboration between architectural lighting brand Apure and Porsche Design.